Home » Energy » The Biodiesel Disaster: Why bad Ideas are Always so Successful? By olduvai in Energy, Environment on February 5, 2019 . Behind the simian mask, there is yours truly, Ugo Bardi, sitting at his desk. 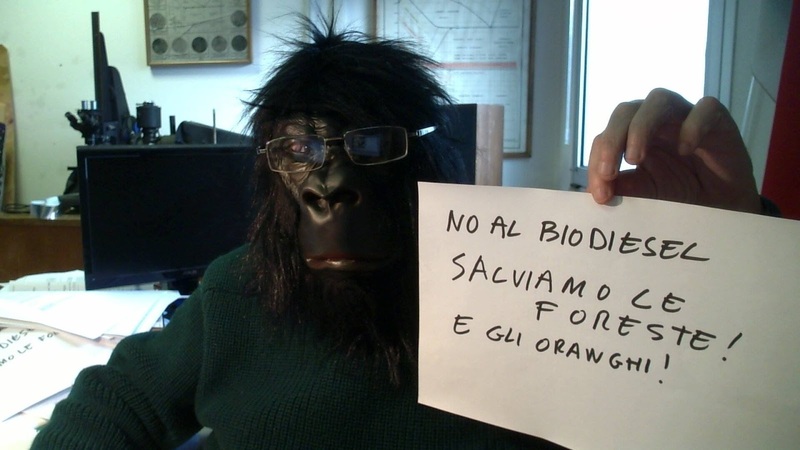 The sign is in Italian, but you can understand that it is against biodiesel and in favor of Orangutans. Sometimes it happens that you are asked a question that forces you to reflect. So, a few days ago, I was at a public meeting on energy and climate and I was telling about the work we do at the university and with the Club of Rome. In the debate, someone asked me: “But, professor, from all these models of the world you make, after all, what did you learne?”. Some questions are not easy when the topic is complex and you have to summarize the answer in a few sentences. And you have to come up with something right away! But I think I could put together a good answer when I said, “The main thing we’ve learned is that the models work well. Even the famous model of ‘The Limits to Growth’ that the Club of Rome had proposed in 1972 still describes reasonably correctly the state of the world today. But this has a consequence: the system is predictable because it tends to move in a certain direction. And this means that changing things is very difficult “. The problem of the difficulty of changing things, even when it would be necessary, came back to me by later on, when reading a recent report on biodiesel. This stuff is really terrible: it causes deforestation and destruction of the fertile soil. In terms of greenhouse gas emissions, it is much worse than traditional diesel fuel.